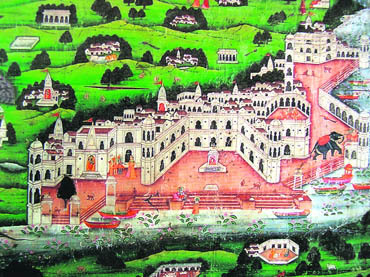 Tirtha patas had little to do with the Western, or even Islamic, ways of map-making. "The highest building in the fort, whitewashed and having a golden pitcher on its top, is the palace of Gangadasa. On the northeast of the same is the lake Ramganga built by Rama, and there is also a temple of Mahadeva built by him. The lake on its south is built by Sita. On the western side is a lake called the Himganga within the Bhimaprasada; it was built by Bhima. On the far western side of the same is a lake full of water like lime; it was built by king Gangadasa. You can see, yonder, the city of Champakapura, full of beautiful houses, like the city of Indra`85." There may not have been much in this for the invader, but then this is by and large the kind of information we get on map-making from literary sources. From an earlier period, we know even less, truly little, in India about cartography: "the production of maps, including the construction of projections, design, drafting’ etc., as the dictionary puts it. The British scholar Susan Gole’s invaluable study of the tradition of map-making, ‘Indian style’, is filled with the most interesting information and images. But much continues to remain unknown, or hidden from view. And yet of one kind of ‘maps’ there is a considerable amount to be seen in India: maps, or topographical renderings, of places of pilgrimage. These, generally known by the name of tirtha patas, have very little to do with the Western, or even Islamic, ways of map-making. Accuracy, or projections, or similar things, are nowhere to be seen in them; there are not even any indications of distances or directions. This, because their function is entirely different: they are meant to be evocations of sacred sites, the mere viewing of which earns merit for a devotee. There are various versions of these. In today’s world, if one is so inclined, one can buy at a place of pilgrimage a cheaply printed and sometimes crudely coloured ‘map’ of the place — Hardwar or Benares or Vaishno Devi, for example — and bring it back home as a calendar-type memento of a visit. But the tradition goes back a fairly long time. There are references to "Kashi patas" in one of the Puranas; that great repository of tales, the Katha Sarit Sagar mentions ‘pilgrimage maps’, and so on. But one sees them nowhere better than in the Jain context, for as a genre of Jain painting, tirtha patas seem to have had a remarkably elevated status. To understand the reverence in which these patas are held, one has to know that these — some of these are very large, like Pichhwai hangings — were not mementos of visits but objects sacred in themselves. As a matter of rule, a painted pata would have depicted on it an auspicious site, like Shatrunjaya, or Girnar (both in Gujarat), complete not only with the most important temple shown on it but its surroundings: hills and precipitous steps leading to it, and all. Essentially, these patas, commissioned sometimes by wealthy devotees, were owned by Jain bhandars, or temples, and were taken out of the store and displayed for the benefit of the community of devotees on special occasions: like the full moon of the month of Kartika, which is one of the holiest days in the Jain calendar. To be able to go on a real pilgrimage at least once in a lifetime to these holy places is — or at least used to be — one of the most cherished desires of a devotee. But when one was not able to undertake such a pilgrimage on some account — infirmity or the lack of means, for instance — one could at least have a darshana of the place/s by gazing at a pata of the tirtha, and, in the act of doing so, earn religious merit. The pata was, thus, a powerful symbol, reminder of a sacred presence, capable of taking a devotee on a mental pilgrimage. Engagingly, many of the old tirtha patas that have survived — some of them go back four centuries or more — are also brilliant works of art: like those in the famed Calico Museum of Textiles and the Sarabhai Foundation at Ahmedabad. As in the case of the cosmological diagrams — another glory of the Jain tradition — the accurate rendering of topography is not what their point is: they are works conceived in the imagination and born of faith. The best among them, like the huge one — teeming with figures and structures — that came suddenly to light in Belgium at Antwerp some years ago, simply take one’s breath away with the boldness and the daring with which they are painted. Jainism is not, however, the only Indian faith in which tirtha patas occupy a central place, one needs to recall. There are evocative patas, serving the same purpose, also in the Buddhist and the Hindu traditions. For the Vaishnavas, a Vraja Yatra pata —showing sacred sites in the environs of Krishna’s birthplace — offers sights that the devotees’ eyes hunger for. For there they all are, even if painted: the holy Yamuna, the Govardhana hill, the Kama forest, the home in which Krishna learnt to crawl on all fours, the sandy bank where he danced his eternal raasa with the gopis. The worshipper can see them through the interstices of the heart.